You can change side walls, back walls and floors. It's easy to assemble (with new joints). Roomboxes can be also disassembled for storage. 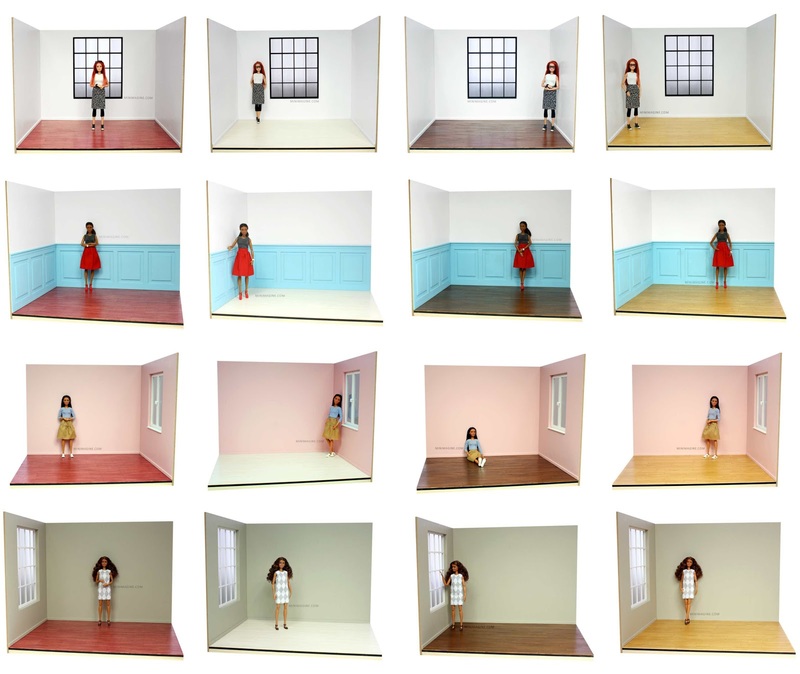 Use two or three walls for photos or build a big space for your dolls by adding walls and floors. There are two sizes of rooms available: medium and small. Side walls are the same for both sizes. 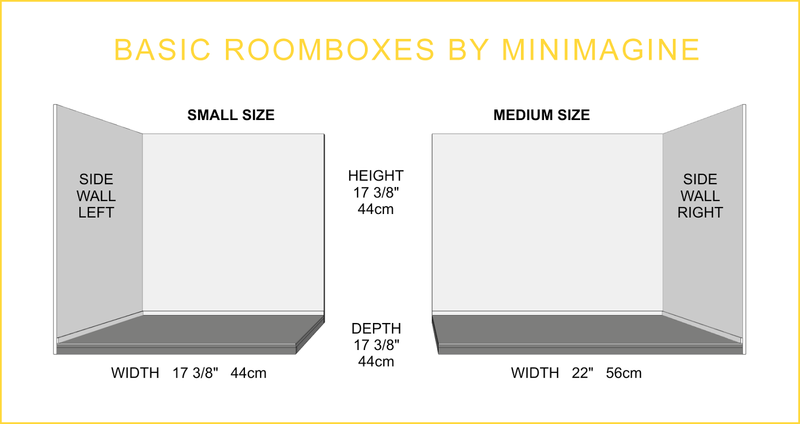 All you need to build a rudimentary roombox is: floor, back wall and one side wall (left or right). Such roombox is great for taking photos. You will be able to add a second side wall or change for example floor later. If you will like it, it's also possible to join the next room. As you can see above, you can choose between small and medium size floors. 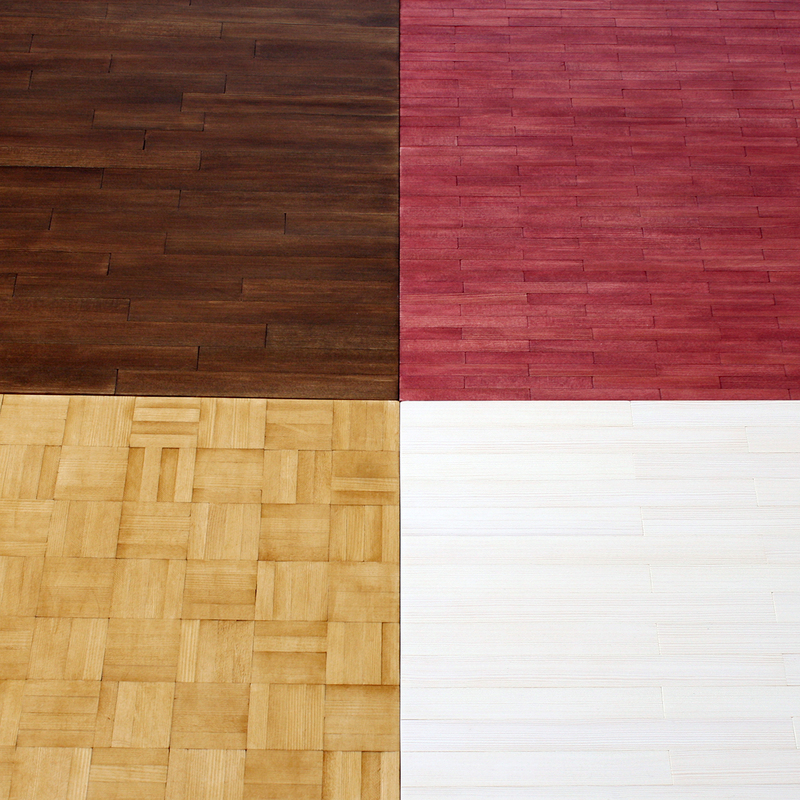 There are four types of floors available at present. They are made of pine wood planks, wood stained and lacquered. As for the colors, wood stained planks look most realistic. There are four available at present: walnut (dark brown), mahogany (reddish), oak and whitened. There are two types of walls: back and side. Additionally, side walls can be one-sided (left or right) or two-sided (for example with an opening). The walls are made of sturdy board and painted with acrylic. Each wall has a baseboard. Painted walls are not perfectly smooth. Some walls have windows - they are made of plywood, wood and real glass pane (they are not openable). All the walls have joints to connect them to other walls and floors. Examples of corner (two-walls) and three-walls roomboxes below. There are five types of back walls at present. Similar to floors, back walls are available in two sizes: small and medium. Back walls can be also joined with each other in line. These walls can be left or right. Most of the side walls fit all back walls. The only exception is the side wall with panelling - it looks good only with matching back wall with pannelling. The one-sided walls without windows can be changed in two-sided walls without opening (on special order). You can choose acrylic color of each side of this wall, acrylic color of opening frame and woodstain color of threshold. Walls can be painted with one of acrylic colors from the list below. I recommend to choose the same color for wall and baseboard - it allows more possibilities when exchanging walls. You can also choose color of windows. Note that colors may slightly differ due to each monitor settings. Now you have to decide which walls and floors are the best for you. To make it easier I prepared several examples of roomboxes. - basic side wall (right) painted in grey. - white back wall (medium size) with pale blue panelling. - medium size back wall with big window with muntins (white wall with black window). - right basic side wall painted in white. - side wall (right) painted in "528 pale apricot" with white casement window. - medium size floor type 3, whitened. Set F (on the left) and set G (on the right). Sets: H, K and L (from left to right). Sets: M, N and P (from left to right). My roomboxes and furniture are for sale several times a year. To be notified when the shop will be open please sign up for the mailing list. More details of roomboxes you can find in my blog posts.